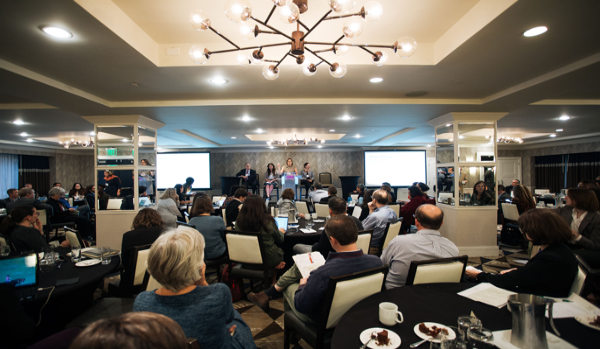 A few weeks ago, the Fund held its national convening in Washington D.C., bringing together over 140 individuals to discuss critical transition policies, programs, strategies, and lessons learned. Perhaps one of the most unique aspects of the Fund’s annual convening is the diversity of transition stakeholders in the room. We had 60 past and present JTF grantees, in addition to labor leaders and union representatives, advocates, funders, and public and private sector representatives. With the Center for Story-Based Strategy facilitating and creating an atmosphere of open dialogue, the convening not only served as a platform for organizations to share strategies and successes across regions, but also to tackle challenging issues and differences in approach. "...the convening not only served as a platform for organizations to share strategies and successes across regions, but also to tackle challenging issues and differences in approach." The importance of relationship-building and its impact on the strength of the overall transition movement are emphasized in the following reflections from convening attendee Veronica Coptis, Executive Director of the Center for Coalfield Justice in Pennsylvania. November 7th to 9th the Just Transition Fund hosted their National Convening with grantees and speakers in Washington, DC. Folks gathered from across the country ready to focus on the work ahead to build just and sustainable communities. From listening to speakers and talking with attendees, it is clear that all of our efforts to create communities where everyone has a living wage, and is welcomed in their community, will be a challenging road. But, everyone I connected with had inspiring stories to keep us moving forward. Throughout the event, we learned from peoples’ experience on what has worked and what has not worked. Time was provided for us to build relationships together and see where each organization’s work intersects with others to increase the overall impact we can all have with our work. For example, talking with folks at Coalfield Development in West Virginia, I learned that they started their economic work by improving homes in need of repair and that transition momentum can spark from just making our community more attractive. Finally, we had some hands-on workshops on sharing our stories, how to influence the federal budget, and applying skills back in our communities. I am really looking forward to using the drama triangle from Center for Story-Based Strategy. Overall, one theme kept recurring in every presentation—whether it was talking about working with labor, building political will, or economic development—it all boiled down to the strength of relationships. How strong our communities and movement will be going forward will be based on the relationships we can lay as foundations, and the trust we can build to create truly just communities. "Overall, one theme kept recurring in every presentation—whether it was talking about working with labor, building political will, or economic development—it all boiled down to the strength of relationships." Veronica Coptis is the Executive Director of the Center for Coalfield Justice in Pennsylvania. Mandy is the Director of Partnerships and Communications at the Just Transition Fund.